Throughout time people have spoken of the undead raising up with a taste for human flesh or the dead being reanimated with a intense rage to kill anything living in sight. Now today this all is a possibility with the people out trying to play God, a airborne case of Rabies could swipe the entire nation, and world causing it to become a Zombie Apocalypse. It would have to be mutated and enhanced which is also possible and could have been done, but the government keeps this secret. A nice mix of viruses could create the ultimate Zombie World as seen in the movies28 days later, and 28 days later. A mix of Rabies (which causes intense rage to the infected), then mixed with Smallpox to spread through the air and create even more zombie like symptoms, and then the encephalitis virus which would flame your brain with fever, thus creating even more rage added onto the rabies, next you add in the Ebola virus which causes the infected to bleed from their guts. 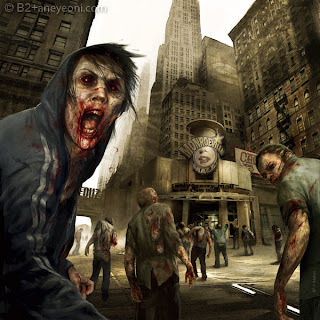 After all this it creates one spreadable Zombie Apocalypse Virus, which could mean the end of the world if the survivors of the virus can overcome the Zombie Horde. The dead rising up has been being told since biblical times and so on into ancient Greece, for example this bible verse “This will be the plague the Lord strikes all people with who warred against Jerusalem: their flesh will rot while they stand on their feet, their eyes will rot in their sockets, and their tongues will rot in their mouths.” Book of Zechariah 14:12, there is also plenty more dead rising from the grave bible passages such as zombies marching through a town and showing them selves to everyone. I believe in a future Zombie Apocalypse, by a terrorist organization or the Government, what do you believe?